But the change wasn't uniform. According to research from UCLA and Columbia University, large areas of the northern part of the state were not severely affected, while Southern California became much browner than usual. 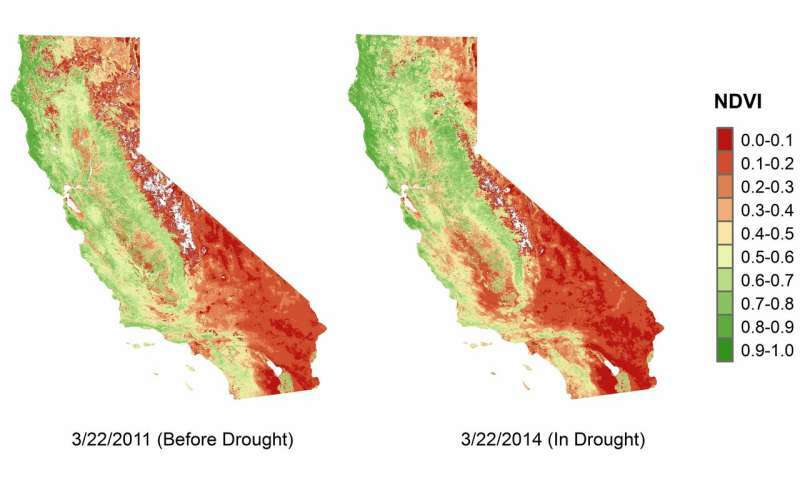 "Southern California is more prone than the northern part of the state to getting severe droughts," said UCLA climate scientist Glen MacDonald, one of the paper's authors. "But that difference seems to be increasing." The problem isn't just a lack of precipitation. Hotter temperatures due to global warming—which accelerate evaporation and make drought effects worse—are playing play a major role in many locations, including Southern California and some parts of the Sierra Nevada. One band of low-to-middle elevation forest in the western Sierra was hit particularly hard and showed drastic browning, MacDonald said. That area of the Sierra Nevada experienced a high concentration of tree deaths, which contributed to California's overall loss of more than 129 million trees since 2010. In contrast, some parts of California became greener—mostly at high elevations and in the far northwestern part of the state, where it's cooler and moister. The researchers examined satellite images dating back to 2000 and historical records dating to 1895. They combined that data with information about drought severity and vegetation indexes—which analyze imagery to determine how densely green a patch of land is. The research was partially funded by UCLA's Sustainable LA Grand Challenge, which seeks to develop informed strategies to transition L.A. County to 100 percent renewable energy, 100 percent local water and enhanced ecosystem health by 2050. Lead author Chunyu Dong, who worked on the project as a UCLA postdoctoral researcher, said the findings reveal a century-long trend in Southern California toward a drier climate that won't affect only plants, but also the lives of millions of people. "The Southern California water shortage will be more severe in the coming decades, especially when we consider the population here is increasing quickly," Dong said. "The one thing that seems to keep coming up is that we'll have more swings in precipitation," he said. "We're going to have our seasonally dry summer and that fine fuel is going to dry out. If it's a hot summer, conditions are ripe for wildfire. The worst thing we can possibly do is say we don't have to worry about this anymore." How climate change and drought will reshape the state's vegetation in the long term remains to be seen. Some coastal sage scrub and chaparral could be replaced by grasslands, and low-elevation shrubland and woodland might even replace some coniferous forest, MacDonald said, but more study is needed. Can our forests survive the next drought? How much drought can a forest take?